Sarah McLachlan will host this year's Juno Awards in London, Ont., where pop star Shawn Mendes, Grammy-winning R&B singer The Weeknd and DJ duo Loud Luxury will be among the top nominees vying for Canadian music honours. Juno organizers on Tuesday revealed that McLachlan — the singer-songwriter and activist best known for hits like I Will Remember You and Angel — will host the 48th annual awards show at London's Budweiser Gardens on March 17. 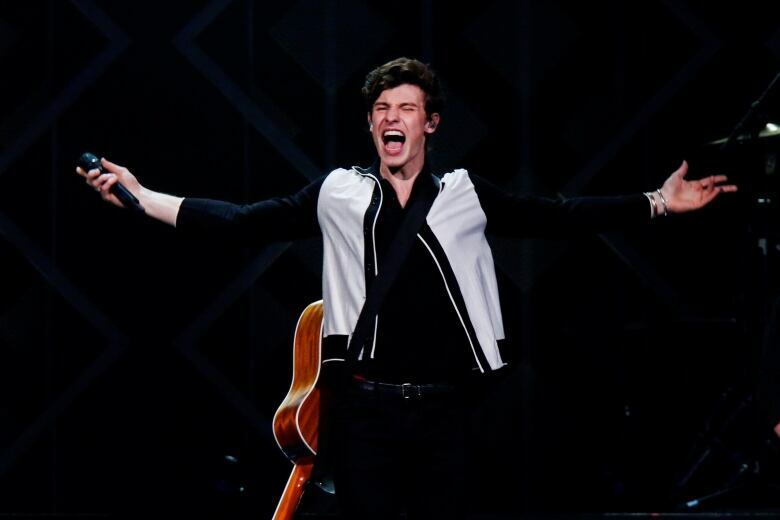 Mendes netted the most nominations of any act with six, including nods for artist, songwriter, album and pop album of the year. The Pickering, Ont.-born musician was also nominated for single of the year for his power ballad In My Blood and for the Juno fan choice award. 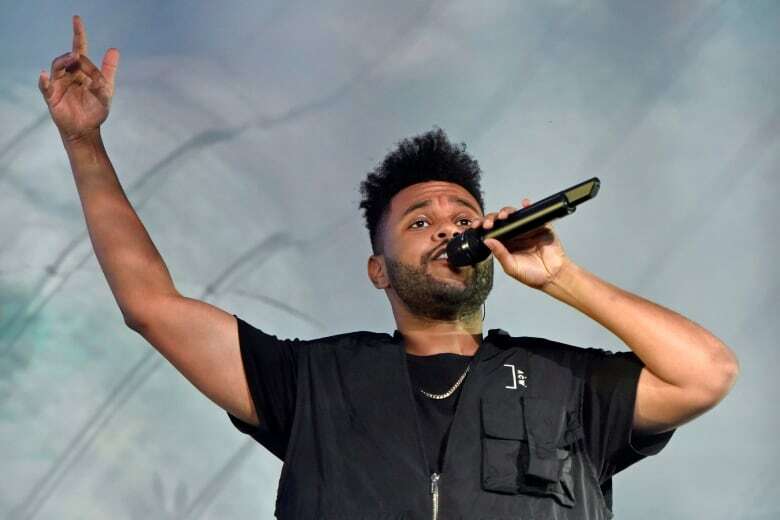 The 20-year-old — who scored his first Grammy nominations in December — topped the five nominations received by Toronto's The Weeknd for artist, album, single and R&B/soul recording of the year, as well as fan choice. Rising stars bülow and Loud Luxury weren't far behind, each nabbing four nominations apiece. Alt-pop singer bülow — recently named to Pandora's Artists to Watch 2019 list — is up for single of the year for her springy, synth-saturated anthem Not A Love Song. She's also up for pop album of year for her debut EP Damaged. 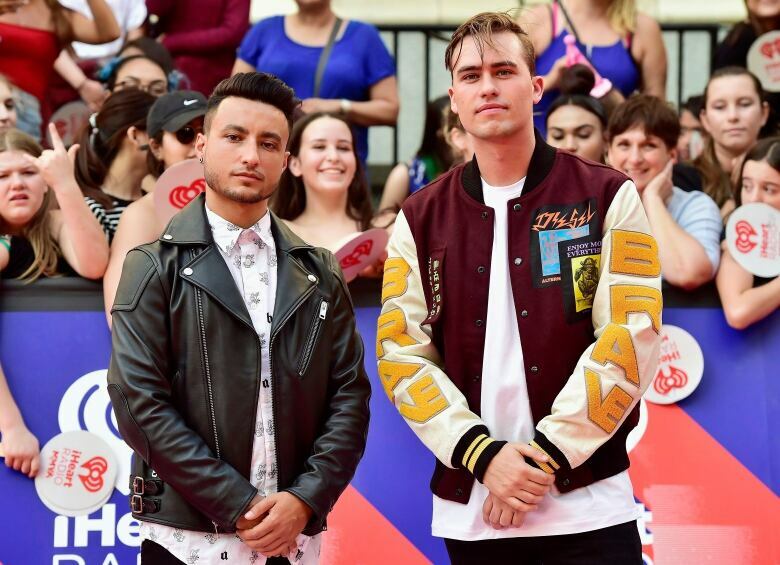 Loud Luxury's Andrew Fedyk and Joe De Pace — Western University grads who will be the show's hometown headliners — will vie for single of the year and dance recording of the year with their multi-platinum single Body, which has been streamed more than 386 million times on Spotify since its release. Brampton, Ont., singer Alessia Cara, who was crowned best new artist at last year's Grammy Awards, and Tory Lanez, the Toronto rapper recently recruited by T-Pain for a 2019 revamp of Big Tymers single Get Your Roll On, each picked up three Juno nominations. Francophone rocker Hubert Lenoir, Toronto hip-hop artist KILLY and Juno veterans Michael Bublé and Three Days Grace also collected three nominations each. Meanwhile, Afie Jurvanen, the Toronto musician who goes by Bahamas, was nominated for songwriter of the year and adult alternative album of the year for his breezy record Earthtones. His music video for No Depression, which centres on a down-on-his-luck but charming puppet, is also up for video of the year. ​Ottawa-area pop pair Elijah Woods x Jamie Fine, who appeared on CTV's The Launch last January and released the single Ain't Easy, are among the first-timers receiving their inaugural Juno nominations this year. CCMA-winning country singer Meghan Patrick, of Bowmanville, Ont., also picked up her first two nominations, as did Toronto duo 88Glam — a group that, along with KILLY, is helping to bolster Toronto's reputation as an incubator for rap and hip-hop talent. Other notable Canadian artists who received nominations include: Jann Arden, Diana Krall, Avril Lavigne, Chromeo, The Sheepdogs, Jessie Reyez and Metric. However, there were some surprising omissions in the list of contenders — perhaps most notably Drake, whose fifth album Scorpion was first on Billboard magazine's top Canadian albums list for 2018 and set a host of music streaming records upon its release. According to Allan Reid, president of the Canadian Academy of Recording Arts, the Toronto rapper did not submit his music for consideration. Concerns over gender and diversity representation continue to plague awards shows like the Junos, which has been grappling with a lack of female nominees in recent years. Last year's show was described by organizers as both a celebration and a "reckoning" — in part because of the flurry of #JunoSoMale criticism that was directed at the music showcase and because of sexual misconduct allegations that continue to emerge against musicians, including Hedley frontman and past Juno-winner Jacob Hoggard. Organizers insisted they were listening to critics and making a concerted effort to include more female and diverse voices at the Junos. But as in previous years, the majority of nominees in the major categories in 2019 are men, as are the technical and production categories. Juno festivities kick off in London on March 11 and will continue until the televised awards show on Sunday, March 17. The awards will be broadcast live across Canada on CBC-TV and CBC Radio, and will be live streamed at cbcmusic.ca/junos. This year's show will be McLachlan's first as host, although the ceremony has featured the 10-time Juno Award winner and Lilith Fair co-founder multiple times before. In 2017, she was honoured during the live Junos broadcast as part of her induction into the Canadian Music Hall of Fame. Juno Fan Choice: Alessia Cara; Avril Lavigne; bülow; Elijah Woods x Jamie Fine; KILLY; Loud Luxury; NAV; Shawn Mendes; The Weeknd; Tory Lanez. 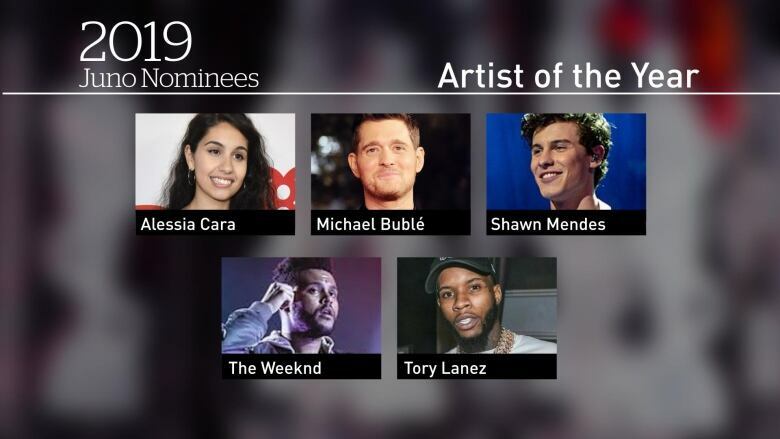 Artist of the year: Alessia Cara; Michael Bublé; Shawn Mendes; The Weeknd; Tory Lanez. 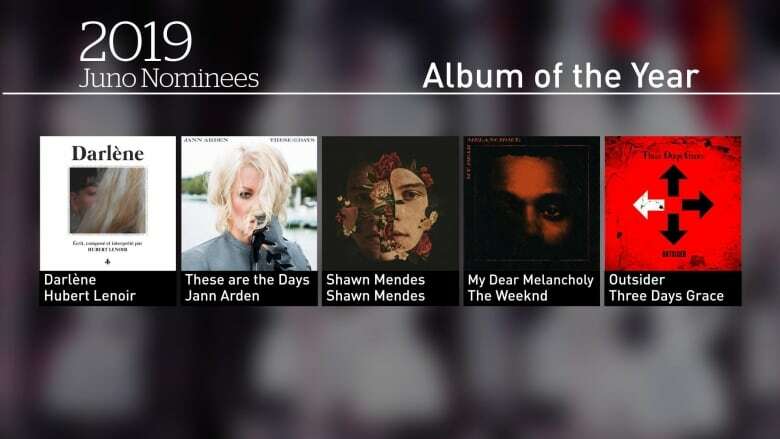 Album of the year:Darlène, Hubert Lenoir; These Are The Days, Jann Arden; Shawn Mendes, Shawn Mendes; My Dear Melancholy, The Weeknd; Outsider, Three Days Grace. Single: Growing Pains, Alessia Cara; Not A Love Song, bülow; Body, Loud Luxury; In My Blood, Shawn Mendes; Pray For Me, The Weeknd. Group: Arkells; Chromeo; Metric; The Sheepdogs; Three Days Grace. Breakthrough artist: bülow; grandson; Johnny Orlando; KILLY; Meghan Patrick. Breakthrough group: 88Glam; Dizzy; Elijah Woods x Jamie Fine; Loud Luxury; The Washboard Union. 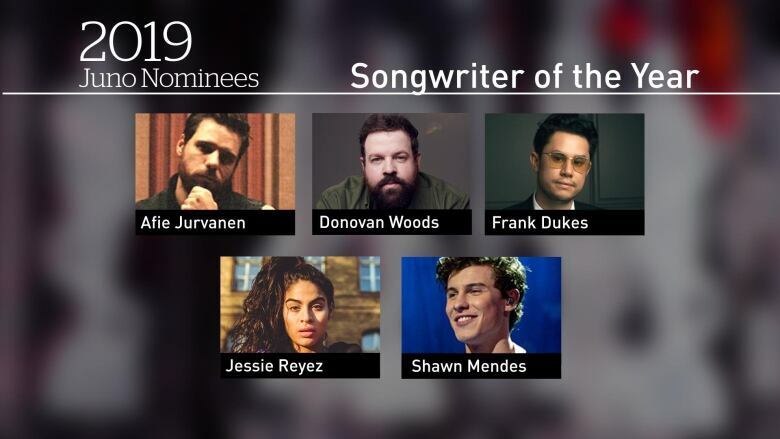 Songwriter: Afie Jurvanen; Donovan Woods; Frank Dukes; Jessie Reyez; Shawn Mendes.